IACC has seen a lot of changes in the last two years. From Lorraine working day and night virtually by herself, to our help and clean up, to the introduction of Xavier, things have been getting progressively more manageable for Lorraine and better for the resident dogs. Now, one of the best things we could have imagined has happened! Two newcomers to Auroville, Josephine and Antim, have arrived on the scene and are doing some incredible work. 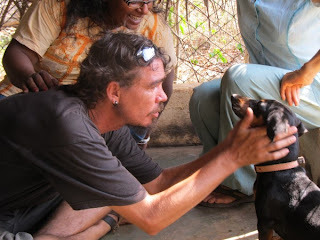 The dogs at IACC, now Animal Care Auroville, and Lorraine are finally getting the help that they needed so desperately when we first arrived. You can stay updated with their progress at the Animal Care Auroville Facebook Page. Best of luck to them! Six months after we left Auroville to begin our project in Delhi, we decided to return and visit IACC. When we first came to the shelter in February, the place was a bit of a mess. The grounds were not kept well, the workers were unreliable, the funds from Auroville were missing, and Lorraine was doing almost everything by herself. 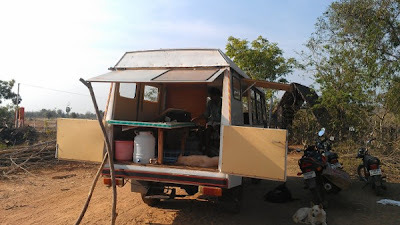 We spent two long month working on the shelter grounds and investigating the root causes of all the issues, all of which resulted in the turnover of the shelter to new management, Xavier of Reve Guest House. We have kept in touch with Lorraine, but we couldn't know exactly how things turned out without visiting ourselves. All we can say is, what an improvement! The grounds are more kept up, the workers are doing a reliable job, the puppies are separated by age, the dog's meals are being supplemented with rice cooked in IACC, a new electric water pump has been installed, and there are quite a few volunteers! Though not everything is perfect and Lorraine still has a lot of work on her plate every day, the shelter seems to be coming out of a depression and moving towards effective work. Lorraine seems to think we have saved her life and given IACC a much needed break ... oh Lorraine! The oldest puppies were recently sterilized, some even in the clinic at IACC! The most incredible transition has been that of Rex, the Rajapulayam hunting dog who had awful skin and was painfully skinny! Look at how beautiful he is now after Xavier gave him some attention, medication, and love! The "teenager" puppy hut constructed in our last weeks at IACC, now has a bed! We helped with de-worming the littlest puppies. Remember them? They were babies 6 months ago! Munchkin, who has turned into a beautiful (and sterilized) young lady! After 2 months working at IACC we have realized that we can't maintain a balanced and healthy life in Auroville. Unfortunately this means that we cannot complete all the work that we intended to do when we first arrived. Things have improved, but now it is time to see new management step in which will maintain and build upon the processes we have started. Xavier, the Aurovillian who adopted Roxy, has agreed to do the job! After visiting the center for the adoption he realized how much good he could do and decided to step in to relieve Lorraine, who looks forward to taking time off after so many years. We will maintain contact with everyone at the Center to ensure that the transition goes smoothly. We wish them the best! 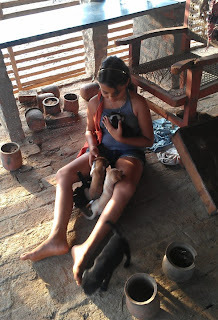 Kids from Auroville coming to play with puppies! We always love when youth are interested in animal welfare! We occasionally meet local and Aurovillian kids who come to interact with our dogs, and our pups love them. We hope that by being allowed and encouraged to show affection for strays the next generation will lead the way to a more compassionate relationship with our companions! Thanks to AV Straw's Dr. Kumar, we have seen our first sterilization at the Center in a long time! 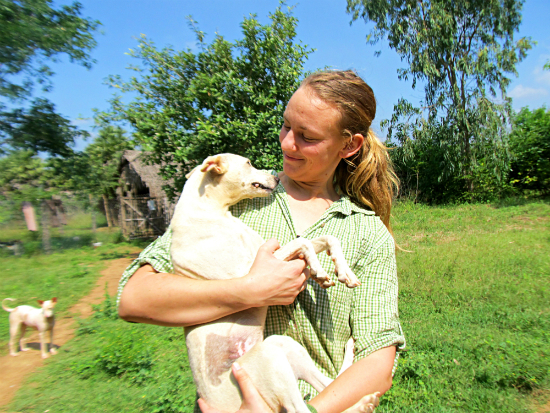 Hornet the dog was rescued near Auroville Kindergarten and brought to us so we could help him find a home. When he arrived we could see that this kiddo needed a surgery! We called Ingrid S. and Dr. Kumar and arranged for it right away. The surgery went smoothly, Hornet was up and running around in no time, and his incision is healing beautifully. Now he is ready for a home! Lucky, arrived just a few weeks ago. We discovered him on the inside of our locked fence, which made it clear that he had been dropped over from the outside. He was terrified and wouldn’t let us near him, so we gave him food and water and let him stay in our entryway. Slowly over the next few days we coaxed him into letting us sit near him and even introduced him to Piper, one of our pups about his age. Slowly but surely he began to become more curious about the rest of the dogs and now he is out and exploring! Now, a few weeks later, he comes running up to us with a wagging tail! What a transformation! Hornet was brought to us with the assistance of Dr. Kumar who uses AV STRAW's blow-dart system for capturing stray dogs. We were called by some folks at Auroville Kindergarten and we were told that he was rabid. It was immediately clear to us when he arrived, however, that he is not sick at all! We kept him in one of our recently built secure areas for new arrivals to observe him for any problems and allow him time to adjust to the smells, sights, and sounds of the Center. After some time we allowed him to begin to explore and meet the resident dogs. Hornet is a really friendly guy and has blended in well with the others. He might even have found a home straight away! Now he will have his sterilization and be on his way. Good luck Hornet! Wow what a quick turn around! Dog lover and Aurovillian Xavier came in to adopt one of the puppies, took one look at Roxy, and decided to take her and a puppy. He and his wife have worked with dogs for years, we are so happy to give this girl a forever home!